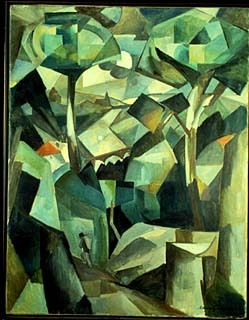 "Paysage" ("Landscape"), a 1911 painting by Albert Gleizes. The painting was at the Mus�e National d'Art Moderne in Paris until it was identified by Hector Feliciano as having been looted by the Nazis from the home of collector Alphonse Kann during World War II. It was returned to Kann's heirs who subsequently sold it.